This award of distinction was established in 2012 by Sam and Helen Szteinbaum. Sam Szteinbaum graduated UCSC in 1982 with a Bachelors Degree in Economics and Mathematics and retired in 2008 from a very successful 25-year career with Hewlett Packard. He is currently Chairman and CEO of the Wonder Years, a preschool provided with four locations in the Bay Area. Helen Szteinbaum serves as Vice President and runs the day-to-day operations of the company. Both Helen and Sam take heart in knowing that this award will help deserving students (as demonstrated through their academic accomplishments) with financial need focus on their education to improve themselves and our community. This award is exclusively for declared BMEC majors who have a financial need, a job, and a 3.0 GPA or higher. 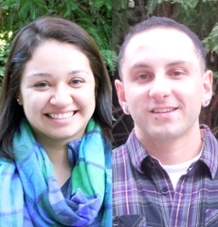 This year's recipients are: Tanya Flores and Joseph Rozo.